We may be a Leicester City owned by a bunch of Thais, but I refuse to bow to calling it 'The Amex'. Brighton's new ground is called the Falmer Stadium. It may be known as 'The Amex' because of its sponsorship contract but that name is an absurd, ugly contraction of it's disgustingly corporate official title, "The American Express Community Stadium". Named after the Thai owners' company our stadium may be, but at least we're open and honest about it. This season is on hold. Leicester look unlikely to escape another season of Championship mediocrity now, sitting eight points behind sixth place and now eighteen behind pace-setters West Ham United. There are clubs that City have gained against, of course, but only as they have suffered their own spells of bad luck. Leicester have failed to deliver consistent results all term, however, and remain as low as they have been since the start of the year, only now with dwindling hopes of a glorious return to the Premier League. With Leicester down to ten men for much of the game, the Seagulls were allowed to attack and it was the Danish goalkeeper who was the Foxes' last bastion of defence. 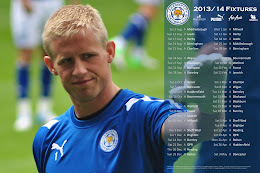 Kasper Schmeichel has proven himself a worthy number one since his arrival at the King Power Stadium in the summer, demonstrating a maturity and leadership ethic his father is surely proud of - and recognises. He's already being described by some as 'Tom Cleverley on steroids' and if he can emulate that midfielder's rise to fame then Danny Drinkwater has a bright future ahead of him. He is stockier than Cleverley but plays a similar game and is equally capable, both technically and physically. Arguably his build gives him an edge of the Manchester United former Foxes' loanee in that respect. He was a stand-out player against Brighton, having shone on début against Middlesbrough last time. That Jermaine Beckford's sending-off was warranted is still a matter of considerable debate, including that between the FA and the football club. Leicester City have lodged an official complaint over the striker's red card, which was reportedly issued after he kicked-out at Lewis Dunk, although that seems to have been majorly exaggerated. Beckford will hope that his red card is rescinded as it could not have come at a worse time. Both the player and club have hit form of late, although not in the league as both would have preferred. Unlike Beckford's red card, the sending-off of Neil Danns was down to poor judgement from the player and not from the referee. Danns' challenge on Vincente was ugly, untidy and clumsy in a place where was guaranteed to be booked when not challenging well. This, sadly, showed a rather lame unintelligence from music-man Danns.